Portmeirion sometimes turns up in the most unexpected of places, and the architecture of Sir Clough Williams-Ellis has graced many tv shows over the years. Several times its imagery has also appeared in comics, usually serving as a setting for Prisoner-style stories or spoofs. Rarely has it appeared in fiction, as itself: Portmeirion, Gwynned, Wales. 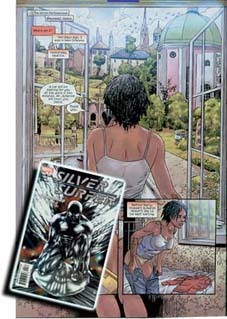 However, in the December issue of Marvel Comics' new SILVER SURFER series (Vol.4, issue 4, $2.25) one of the main characters, Denise Waters, awakes to find herself in the village, - and a caption clearly states it as being Portmeirion. There are references to The Prisoner too. The series is even discussed by another character in the story who admits to being a fan of the show. The use of Portmeirion in this issue is interesting as the story arc, "Communion", concerns the mysterious abduction of Waters' child by the alien Silver Surfer and following various leads, Denise has surreal encounters. The strip is written by Dan Chariton and Stacy Weiss and drawn by Lan Medina. (Brought in after the original artist, Milx, failed to return editor's calls. Fear not - he was only bunking off, not abducted to The Village). Although the artwork is superb it should be said that the use of Sir Clough's architecture isn't entirely accurate. Nevertheless, the panels evoke the right feel of the village, so such artistic license can be excused. A compliment must be paid to Edgar Taded the colourist for using the appropriate pastel shades in depicting Portmeirion. The current story-arc concludes in issue 6, out in February. It's worth noting that so far Portmeirion has only appeared in issue four, as the story involves a globe-trotting quest theme. (Thanks to Elisabetha D of the alt.tv.prisoner newsgroup for bringing this issue to my attention). UPDATE: Don't worry if you missed issue four's Portmeirion setting. The six issue series is being collected into one softback book. SILVER SURFER: COMMUNION will be published by Marvel in April 2004. 144 pages for $14.99. (UPC: 5960611319-00111). The book will also be available as an import in UK comic shops (NOT newsagents).